A brilliantly sunny Saturday morning in late March. My wife Clare and I are preparing to drive to Stratford-upon-Avon, and since we have the luxury of time, out comes “Jenkins”. This is Simon Jenkins’s essential guidebook England’s Thousand Best Churches, with photographs by Paul Barker from the Country Life archive, first published by Allen Lane in 1999. My copy is battered now, burnished by hundreds of visits to the churches therein. 387 such visits, in fact, detailed in a diary that I have been keeping of my church going since 1 January 2000. A week before I had been given Jenkins as a Christmas present, and completist that I am, I determined then to visit each of the thousand across the next decade. Just over nineteen years later, I am only a little over one-third of the way through, and now my aim is to visit them all before I am interred in one of their graveyards. I have, however, identified the fake entry that Jenkins presumably included to fight back against anyone foolish enough to re-publish his list without permission. Heaven preserve the little places. Wheatfield is a charming building, set on a parkland slope dotted with oak, cedar and beech beneath the Chiltern escarpment and just visible from the M40. It was the first of my ‘thousand churches’, and will always be a favourite. One of the great things about church going is that it takes you off the main thoroughfares and down country lanes and though sweeping landscapes that you would likely never otherwise visit. Such is the case with our modest pilgrimage to Wheatfield, necessitating leaving the motorway at Junction 6 and following by-roads through Lewknor and South Weston. We skirt the tiny village of Adwell and arrive at a rusted metal stile giving entrance to a lush field. Across this a faint grassy path leads to St Andrew. The deep blue sky is flecked with wisps of cloud, the central plain of England stretches out in all directions, with far-off clusters of trees and distant fine houses. 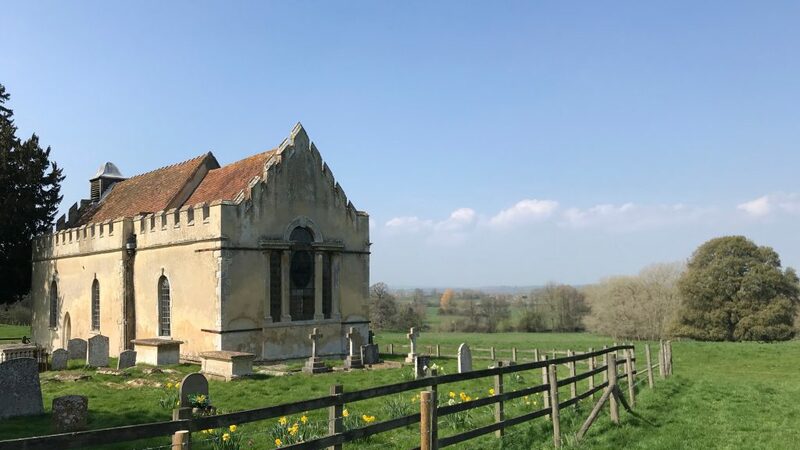 Anticipating an interior that is, according to Jenkins, ‘flooded with light, splashing across the peach-coloured stucco wash’, we are instead faced with a fence of barbed wire around the church and a single gate secured by a chain and padlock. Clearly, much has changed since Jenkins came, and I have since discovered that others have had little more success in gaining entry – although back in 2002 the creators of WestGalleryChurches.com could at least take photographs through the murky windows. The barbed wire encircling the churchyard meant that even this was not an option for us. Before this visit my self-imposed stricture was that for a visit to count towards my total I had to set foot inside. 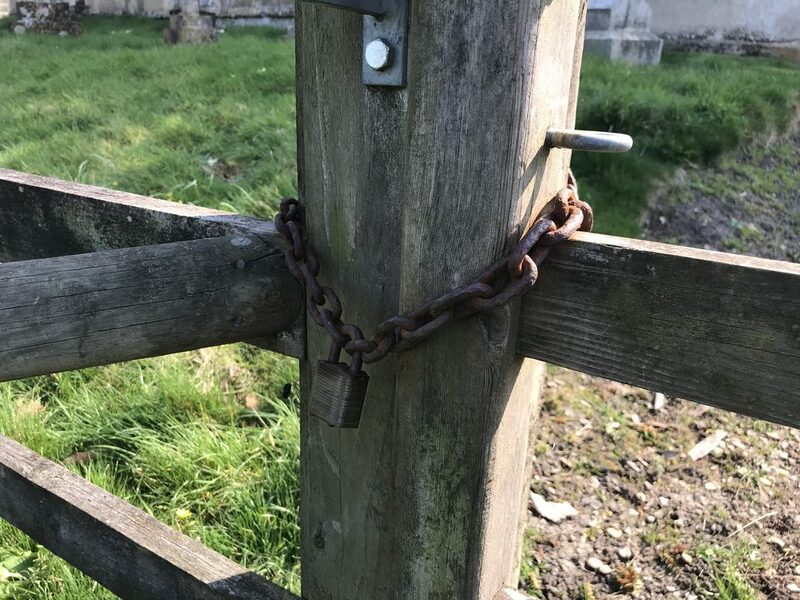 But increasingly churches, whether for reasons of security or safety, are restricting access or making it all-but impossible. From now on I have decided that I am permitted to enter a tick in Jenkins if I have had the kind of meaningful engagement with a building that I felt I had at Wheatfield. On then, after a pub lunch (another plus of church going) to our second destination, Burton Dassett, further up the M40 in Warwickshire. This is a wild spot at the watershed of three Englands… The point is marked by a sudden jumble of steep hillocks, as if England’s tectonic plates had yet to sort out some geological dispute. And indeed the terrain is pockmarked and cracked, and yet verdant, welcoming and dotted with friendly sheep and lambs. We park in the well-maintained park and walk down to just outside a lower gate where All Saints’ Church squats securely on a hillside. Jenkins awards 2 stars, both for the spectacular stage-like interior with banks of steps rising to the main altar (and a consequence of the contour across which it is built) and for the gallery of wall paintings and carvings that distinguish the interior. There is always a moment as you approach the closed door of a new church when you wonder if it will be locked, if a key can be tracked down, or if the exterior alone is going to have to justify the journey. 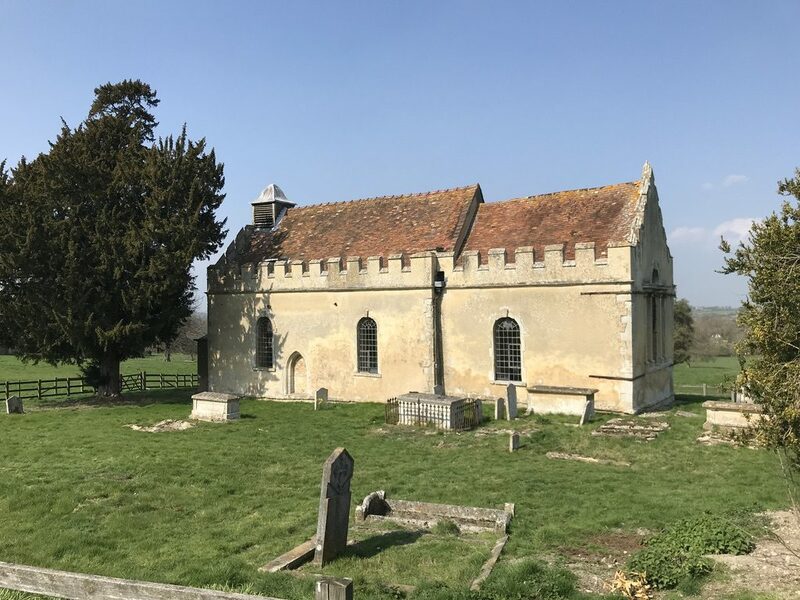 Two frustrations with Jenkins are that he fails to give a postcode for each church, which with a satnav system might drain away a little of the mystery that sometimes accompanies a search for an especially obscure building. Nor does he include any sense of when a church might be open. 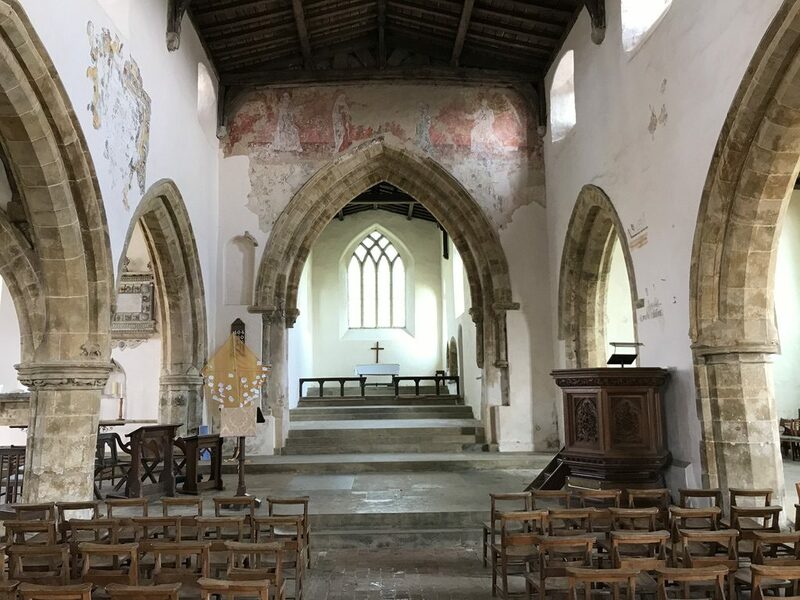 Of course, the latter information (if not the former) is subject to frequent change, but now there is a supplement to Jenkins that provides this and more: the new Explore Churches website from The National Churches Trust. The church is built into a hillside, so the climb inside from tower end to altar is considerable. On the walls are paintings from several centuries that have been restored. The stone altar in the Lady Chapel was wisely smuggled away in anticipation of the Reformation and buried for safekeeping. 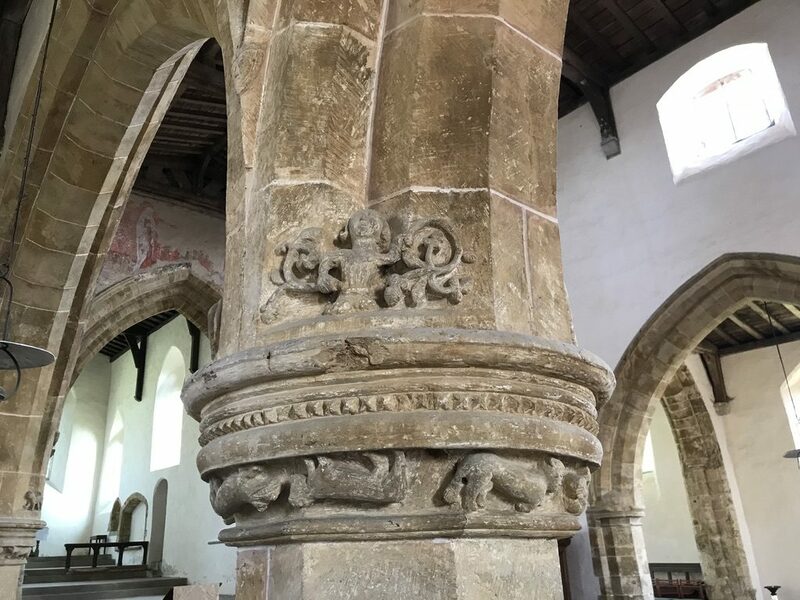 The pillars have intriguing carvings, among them a Green Man and several strange beasts chasing each other around the stonework. Too many searches in Explore Churches still return ‘More information about this church coming soon’, but it is of potentially enormous utility and I shall be consulting it frequently, checking in advance before journeying to the likes of All Saints’. The church has its own website but this is – understandably – more concerned with the current appeal for ‘Toilets and Taps!’ than with the building’s cultural gems. Little celebrated and just one of hundreds of comparable galleries of sacred art, All Saints’ contains marvels, including exceptional medieval paintings – you can see the Doom above the chancel arch in the interior shot above – and crude yet complex sculptures that speak of both pagan and Christian beliefs. 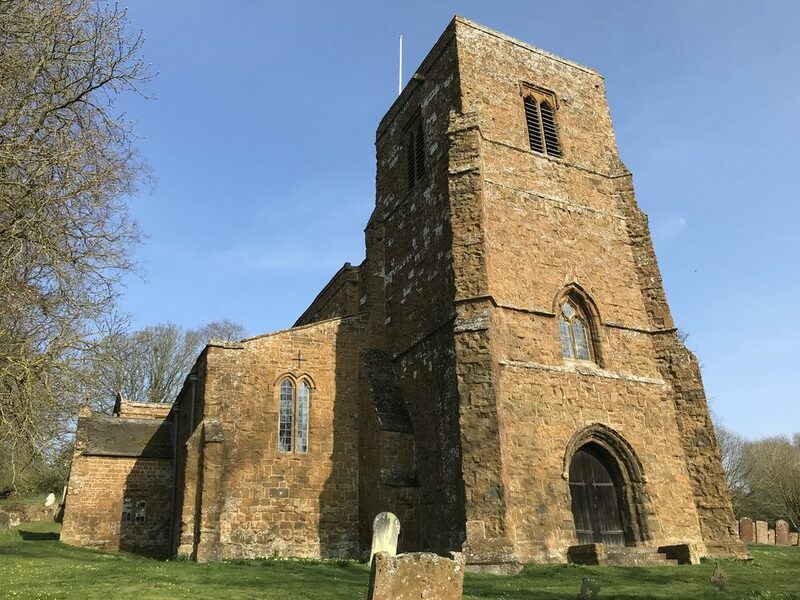 A wonderfully detailed (if a little dry) description of the church and its parish can be found at the remarkable resource of British History Online, which also has detailed information about Wheatfield and the church of St Andrew. 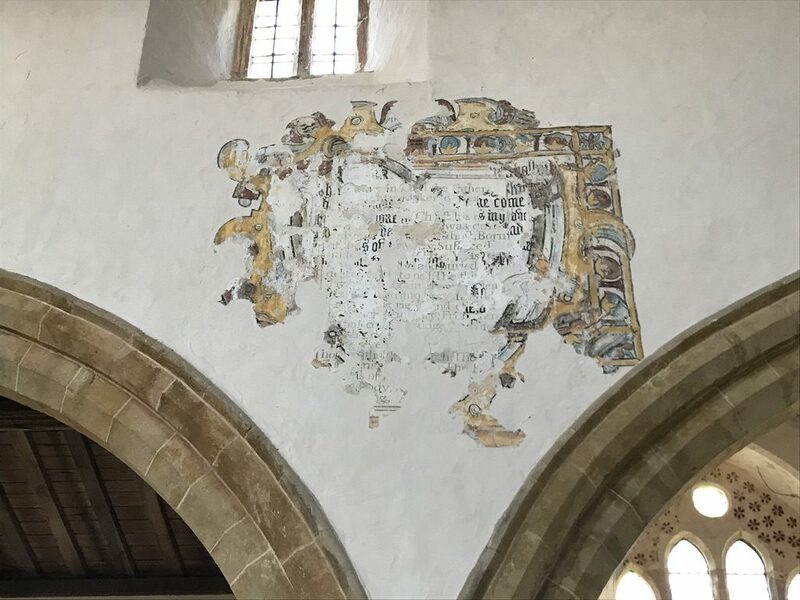 Panels in All Saints’ itself offer further information about the wall painting that intrigued me the most, which is pictured above. This is a post-Reformation text, an example of the Protestant Word attempting to efface and replace Catholic imagery, and appears to consist of a frame in which three palimpsests are visible. That is, there are three distinct layers of writing, with the earlier ones visible through the fragments of the later: seemingly a Lord’s prayer from the late 16th or early 17th century; a 17th century scheme in heavy gothic lettering, and also likely a Lord’s Prayer; and then an 18th century Creed. What a wonderful image-text, made all the more rich and strange by the passing of time across five hundred years and more. 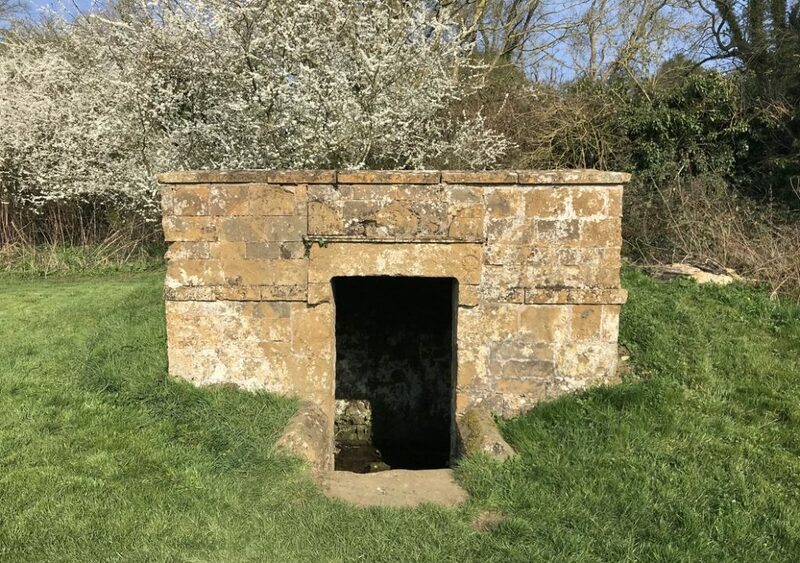 Outside the church, there is a further resonant structure, a ‘holy well’ that almost certainly dates back to before the Reformation when the waters from such springs were believed to have healing powers. The stone housing, however, is Victorian. Apart from the basic information noted above, Jenkins offers almost all that the committed church goer needs, especially if they supplement his words (and ratings) with the pamphlets or guidebooks available in many places. But while he is invaluable on medieval, Georgian and – especially – Victorian structures, Jenkins has something of a blindspot in relation to 20th century architecture. Which is why a new book from the Twentieth Century Society, 100 Churches 100 Years, is so welcome. Indeed, I think this deserves its own post, which I’ll contribute later in the week, but note also that the society issued a key press release this week, Twentieth Century Society calls for Greater Recognition for C20 Church Architecture. This argues convincingly for more attention to be paid to the fabric of churches built in the twentieth century. Every breeze that blows over a meadow is said to leave some memory of its passing in the lie of the grass. To make the acquaintance of an English church is to witness the breeze of history make its imprint on stone, brick, wood and plaster. No church is identical with any other. Nowhere else in the world are places of worship so idiosyncratic as in England. Each arose from its particular landscape and culture, reflecting local materials, patronage and politics, even the liturgical views of the vicar. The humblest church is a casket of varieties. A delightful post, John. I take off my bicycle clips to you. Thanks, Ed – looking forward to seeing Megan again, and you at some point also. And, Luke, you’re too kind, but I must admit I had you in mind as my ‘ideal reader’ for this one. 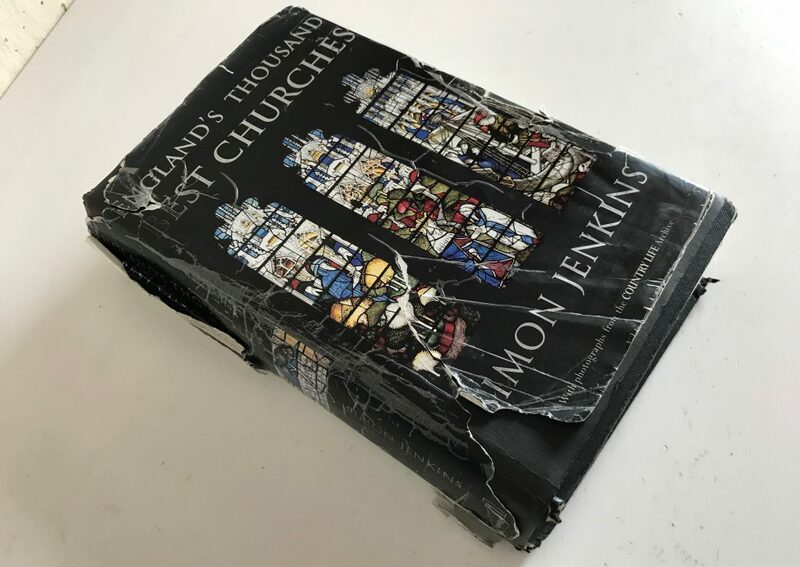 I have to confess to not be a great fan of Jenkins’s book (star ratings for churches, really?). I like visiting old churches, but obliquely, as social signifiers, or curious relics whose stones have outlasted the reason for putting them together. And I like the wall paintings.